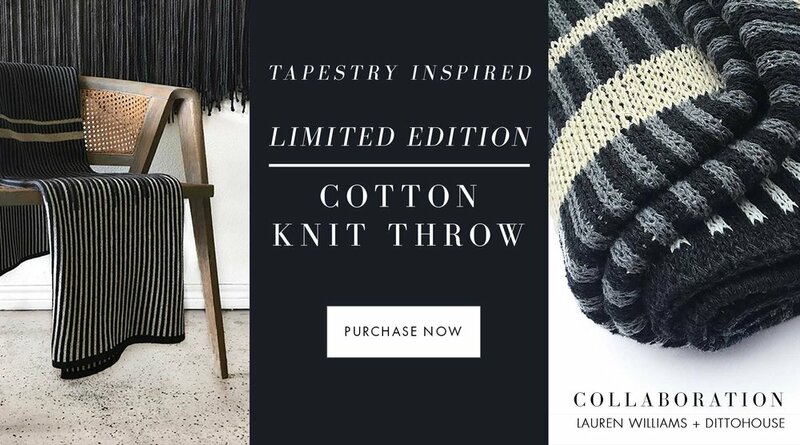 PreviousMedium Tapestry "Gypsy Sky" NextMedium Tapestry "Our Gold Lines"
The Canvas With Movement® GRAY Collection, by artist Lauren Williams, is a new series of one-of-a-kind, fiber art created using Lauren’s signature line of 100% wool strands. Carefully spun with rare black wool in a perfected proportion, these naturally created gray fibers are suspended from walnut wood to create a canvas, but with movement. Utilizing a palette of light and dark gray throughout the collection, this series entertains a crowd with a modern style. The “Rock n’ Roll” design features the light gray fibers suspended from walnut wood. Through the center, a horizontal wave of navy dye expands towards the top and bottom of the piece. Gold, copper, and silver splatter paint is added in a horizontal pattern through the center to accentuate the varying shades of the dye. The “Rock n’ Roll” tapestry is an edgy and contemporary addition to any wall.